The Site is owned by the RAMCIEL Magazine.. Unless otherwise explicitly specified, all materials that are included in or are otherwise a part of the Site (including past, present and future versions), including, without limitation: graphics; layout; text; instructions, images; audio videos; designs; advertising copy; logos; domain names; trade names; trademarks, service marks and trade identities and accompanying logos, designs and product marks); any and all copyrightable material (including source and object code); the “look and feel” of the Site; the compilation, assembly and arrangement of the materials of the Site; and all other materials related to the Site (collectively, the “Materials”) are owned, controlled or licensed by RAMCIEL Magazine., its subsidiaries or affiliates and are protected from unauthorized use, copying and dissemination by copyright, trademark, patent, publicity and other laws, rules, regulations and international treaties. The Materials may not be copied, reproduced, downloaded or distributed in any way, in whole or in part, without the express permission of RAMCIEL Magazine., unless and except as is expressly provided in these Terms. Any unauthorized use of the Materials is prohibited. You also agree that you will not: (a) use any robot, spider, rover, scraper, or any other data mining technology or automatic or manual process to monitor, cache, frame, mask, extract data from, copy or distribute the Materials (except as may be a result of standard search engine or Internet browser usage), nor will you (b) modify, frame, reproduce, archive, sell, lease, rent, exchange, create derivative works from, publish by hard copy or electronic means, publicly perform, display, disseminate, distribute, broadcast, retransmit, circulate to any third party or on any third-party web site, or otherwise use the Materials in any way for any public or commercial purpose except as specifically permitted by these Terms or RAMCIEL Magazine. The Site may provide you and others with the opportunity to participate in forums, blogs, message boards, social networking, social communities and other communication functionality and may provide you with the opportunity, through such features or otherwise, to submit, post, display, transmit, perform, publish, distribute or broadcast content and materials to RAMCIEL Magazine. or the Site, including, without limitation, photographs, writings, music, video, audio recordings, computer graphics, testimonials, pictures, data, questions, comments, suggestions or personally identifiable information (collectively, “User Content”). You grant to RAMCIEL Magazine. the unrestricted, unconditional, unlimited, worldwide, irrevocable, perpetual and royalty-free right and license to host, use, copy, distribute, reproduce, disclose, sell, re-sell, sub-license, display, perform, transmit, publish, broadcast, modify, reformat, translate archive, store, cache or otherwise exploit in any manner whatsoever, all or any portion of your User Content for any purpose whatsoever in all formats; on or through any media, software, formula or medium now known or hereafter developed; and with any technology or devices now known or hereafter developed and to advertise, market and promote the same. You further agree that RAMCIEL Magazine. is free to use any ideas, concepts, know-how or techniques contained in any User Content you send to the Site or RAMCIEL Magazine., for any purposes whatsoever, including, without limitation, developing, writing and publishing articles or other material and/or marketing products or services using such User Content without remuneration of any kind. You further perpetually and irrevocably grant RAMCIEL Magazine. the unconditional right to use and exploit your name, persona and likeness included in any User Content and in connection with any User Content, without any obligation or remuneration to you. You also grant to RAMCIEL Magazine. the right to sub-license and authorize others to exercise any of the rights granted to RAMCIEL Magazine. under these Terms; and each such third party will be entitled to benefit from the rights and licenses granted to RAMCIEL Magazine. under these Terms. You further authorize RAMCIEL Magazine. to publish your User Content in a searchable format that may be accessed by users of the Site and the Internet. Except as prohibited by law, you waive any moral rights you may have in any User Content you submit, even if such User Content is altered or changed in a manner not agreeable to you. You agree that RAMCIEL Magazine. has no obligation to monitor or enforce your intellectual property rights to your User Content but has the right to protect and enforce its and its licensees’ licensed rights to your User Content, including without limitation by bringing and controlling actions in your name and on your behalf (at RAMCIEL Magazine.’s cost and expense, to which you hereby consent and irrevocably appoint RAMCIEL Magazine. as your attorney-in-fact, with the power of substitution and delegations, which appointment is coupled with an interest). You further acknowledge and agree that RAMCIEL Magazine. will not have any obligation to review, monitor, display, accept or exploit any User Content and RAMCIEL Magazine. may, in its sole discretion, delete, move, re-format, edit, alter, distort, remove or refuse to exploit User Content without notice or liability; provided, however, that RAMCIEL Magazine. reserves the right to treat User Content on any Site, or on certain portions of any Site, as content stored at the direction of users for which RAMCIEL Magazine. will not exercise editorial control except, in our discretion, to enforce the rights of third parties and the content restrictions set forth below in our Community Usage Rules when violations are brought to RAMCIEL Magazine.’s attention. Such User Content posted at your or other users’ direction need not, however, be maintained on the Site by us for any period of time and you will not have the right, once posted, to access, archive, maintain or otherwise use such User Content on the Site. You agree and understand that RAMCIEL Magazine. is not obligated to use User Content and that you will not receive any consideration or compensation for your User Content or for any exploitation of it. You agree to include, and not remove or alter, RAMCIEL Magazine.’s trademark, copyright or other proprietary rights notices, as provided by RAMCIEL Magazine. on the Site and within digital content used to display any Materials authorized for Viral Distribution and you agree to comply with any Viral Distribution usage guidelines that may be provided by RAMCIEL Magazine. from time to time. RAMCIEL Magazine. does not encourage or reward you for Viral Distribution and you agree not to engage in spamming or other unlawful or controversial behavior in connection with any Viral Distribution tools made available on or through the Site. 18 and older only please. Community members must be 18 years and older with no exceptions. Membership through our registration process and agreement to these Terms is required to participate in the Community. Keep it relevant. Your User Content should relate to the content on the Site, including beauty, love, style, music, video and news and should be intended to add to the discussion and community on the Site – it should not include irrelevant topics or postings. Please follow codes of social decency. Express yourself with non-offensive individual self-expression. Be respectful of others opinions and comments so we can continue to build a Community for everyone to enjoy. If you think your User Content might offend someone, chances are it probably will and it doesn’t belong on the Community. Cursing, harassing, stalking, posting insulting comments, personal attacks, gossip or similar actions are prohibited. Your User Content may not threaten, abuse or harm others. Your User Content may not include any negative comments that are connected to race, national origin, gender, sexual preference or physical handicap or that are defamatory, slanderous, indecent, obscene, pornographic or sexually explicit. Be honest and do not misrepresent yourself or your User Content. Do not impersonate any other person, user or company or upload or post User Content that you know is false, fraudulent, deceptive, inaccurate, misleading or that misrepresents your identity or affiliation with a person or company. If you have received any free products/services, or anything else of value for your comments about a product or service, disclose this in your User Content. If you register with us, you agree to accept responsibility for all activities that occur under your account or password, if any, and you agree you will not sell, transfer or assign your membership or any membership rights. You are responsible for maintaining the confidentiality of your password if any, and for restricting access to your computer (or other Internet access device, as applicable) so that others may not access the password-protected portion of the Site using your name in whole or in part. RAMCIEL Magazine. reserves the right to terminate your account or otherwise deny you access in its sole discretion without notice and without liability. You represent and warrant that: (i) you are at least eighteen (18) years of age and you have the legal right and capacity to enter into these Terms in your jurisdiction and to comply with these Terms or, if you are a minor, your parent or legal guardian has read and agreed to these Terms on your behalf; (ii) all information you provide to RAMCIEL Magazine. is accurate and complete; (iii) you hold and will continue to hold all rights necessary to enter into and perform your obligations under these Terms. You also agree that you will be responsible for obtaining and maintaining all Internet, computer hardware and other equipment needed for access to and use of the Site and you will be responsible for all charges related thereto. (a) Links to Third Party Sites. This Site contains links to other web sites that we do not own (“Third Party Sites”). Links to Third Party Sites are provided solely as a convenience to you and do not constitute any endorsement or sponsorship by RAMCIEL Magazine. of the Third Party Sites or the information, content, products, services, advertising or other materials provided or made available on or through such sites, or the owners, operators or sponsors of such sites. You acknowledge and agree that we are not responsible or liable, directly or indirectly, in connection with your use of any Third Party Sites or for any information, content, products, services, advertising or others materials provided or made available on or through such sites. (b) Third Party Content. We may make content provided by a third party, such as articles or blog posts, available on the Site. Any views expressed in such third party content are attributable to the author of the applicable content and should not be attributed to RAMCIEL Magazine. RAMCIEL Magazine. grants you the revocable permission to link to the Site; provided, however, that your website, or any third party web sites that link to the Site: (a) may only link to the Site’s home page unless RAMCIEL Magazine. has provided prior, written consent to link to other pages; (b) must not frame or create a browser or border environment around any of the Materials on the Site or otherwise mirror any part of the Site; (c) must not imply that RAMCIEL Magazine. or the Site is endorsing or sponsoring it or its products, unless RAMCIEL Magazine. has given it prior written consent; (d) must not present false information about, or disparage, tarnish, or otherwise, in RAMCIEL Magazine.’s sole opinion, harm RAMCIEL Magazine. or its publications or services; (e) must not use any RAMCIEL Magazine. trademarks without the prior written permission from RAMCIEL Magazine. ; (f) must not contain content that could be construed as distasteful, offensive or controversial or otherwise objectionable (in RAMCIEL Magazine.’s sole opinion); and (g) must be owned and controlled by you or the person or entity placing the link, or otherwise permit you to enable such link subject to these Terms. By linking to the Site, you agree that you do and will continue to comply with the above linking requirements. Notwithstanding anything to the contrary contained in these Terms, RAMCIEL Magazine. reserves the right to prohibit linking to the Site for any reason in our sole and absolute discretion even if the linking complies with the requirements described above. You agree that the Mobile Features for which you are registered may send communications to your mobile device regarding RAMCIEL Magazine. or other parties. Further, we may collect information related to your use of the Mobile Features. If you have registered for Mobile Features, you agree to notify RAMCIEL Magazine. of any changes to your mobile number and update your account(s) on the Site to reflect this change. Any items that we make available for download or use from the Site and/or our servers (the “Downloadable Items”) are the copyrighted work of RAMCIEL Magazine. or its licensors or suppliers. Your use of the Downloadable Items may be governed by Additional Terms, which may be included with the Downloadable Items. Please carefully read any Additional Terms to determine the full extent of conditions governing the use of such Downloadable Items. WITHOUT LIMITING THE FOREGOING, COPYING OR REPRODUCTION OF THE DOWNLOADABLE ITEMS TO ANY OTHER SERVER OR LOCATION FOR FURTHER REPRODUCTION OR REDISTRIBUTION IS EXPRESSLY PROHIBITED, UNLESS SUCH REPRODUCTION OR REDISTRIBUTION IS EXPRESSLY PERMITTED BY THE LICENSE AGREEMENT APPLICABLE TO SUCH DOWNLOADABLE ITEMS. Note that if you install certain applications that may be available via the Site, you consent to the download of software to your computer and accept these Terms and any Additional Terms related to such application. Disclaimers and Limitation of Liability By using the RAMCIEL Magazine. Web Site, you expressly agree that use of the RAMCIEL Magazine. Web Site is at your sole risk. The RAMCIEL Magazine. Web Site is provided on an “as available” basis. Neither RAMCIEL Magazine. nor its parent company, affiliates, subsidiaries or designees nor each of their respective officers, directors, employees, agents, third-party content providers, designers, contractors, distributors, merchants, sponsors, licensors or the like (collectively, “Associates”) warrant that use of the RAMCIEL Magazine. Web Site will be uninterrupted or error-free. Neither nor its Associates warrant the accuracy, integrity or completeness of the content provided on the RAMCIEL Magazine. Web Site or the products or services offered for sale on the RAMCIEL Magazine. Web Site. Further, RAMCIEL Magazine. makes no representation that content provided on the Web site is applicable to, or appropriate for use in, locations outside of the United States. RAMCIEL Magazine. and its Associates specifically disclaim all warranties, whether expressed or implied, including but not limited to warranties of title, merchantability or fitness for a particular purpose. No oral advice or written information given by RAMCIEL Magazine. or its Associates shall create a warranty. Under no circumstances shall RAMCIEL Magazine. or its Associates be liable for any direct, indirect, incidental, special or consequential damages that result from your use of or inability to use the RAMCIEL Magazine. Web Site, including but not limited to reliance by you on any information obtained from the RAMCIEL Magazine. Web Site that results in mistakes, omissions, interruptions, deletion or corruption of files, viruses, delays in operation or transmission, or any failure of performance. The foregoing Limitation of Liability shall apply in any action, whether in contract, tort or any other claim, even if an authorized representative of RAMCIEL Magazine. has been advised of or should have knowledge of the possibility of such damages. User hereby acknowledges that this paragraph shall apply to all content, merchandise and services available through the RAMCIEL Magazine. Web Site. Some states do not allow the exclusion or limitation of incidental or consequential damages, so the above limitation or exclusion may not apply to you. You agree to defend, indemnify and hold the RAMCIEL Magazine. Parties harmless from and against any and all claims, damages, costs, investigations, liabilities, judgments, settlements and expenses, including attorneys’ fees, that directly or indirectly arise from or are otherwise directly or indirectly related to: (a) User Content; (b) your use of the Site or activities in connection with the Site; (c) your breach or anticipatory breach of these Terms; (d) your violation of any laws, rules, regulations, codes, statutes, ordinances or orders of any governmental and quasi-governmental authorities, including, without limitation, all regulatory, administrative and legislative authorities; (e) information or material transmitted through your computer, even if not submitted by you, that infringes, violates or misappropriates any copyright, trademark, trade secret, trade dress, patent, publicity, privacy or other right of any person or defames any person; (f) any misrepresentation made by you; or (g) the RAMCIEL Magazine. Parties’ use of your information. RAMCIEL Magazine. reserves the right to assume the exclusive defense and control of any matter otherwise subject to indemnification by you (in this case, you will cooperate as fully required by the RAMCIEL Magazine. Parties in the defense of any claim), and you will not in any event settle any claim without the prior written consent of a duly authorized employee of RAMCIEL Magazine..
RAMCIEL Magazine. reserves the right to terminate your access to and use of the Site in its sole discretion, without notice and liability, including, without limitation, if RAMCIEL Magazine. believes your conduct fails to conform with these Terms. RAMCIEL Magazine. also reserves the right to investigate suspected violations of these Terms, including, without limitation, any violation arising from any e-mails you send to the Site or RAMCIEL Magazine.. Any violation of these Terms may be referred to law enforcement authorities. Upon termination of your access to the Site, or upon demand from RAMCIEL Magazine., all rights granted to you under these Terms will cease immediately, and you agree that you will: (a) immediately discontinue use of the Site; (b) destroy all Materials obtained from the Site and all related documentation; and (c) as applicable, pay any amounts owed to RAMCIEL Magazine. in full within thirty (30) days from the date of such termination and continue to pay any other amounts owed under these Terms. 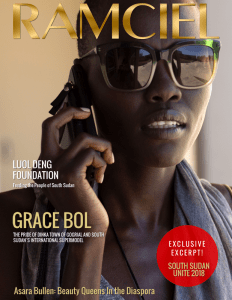 The information provided on the Site is not intended for distribution to or use by any person or entity in any jurisdiction or country where such distribution or use would be contrary to law or regulation or which would subject RAMCIEL Magazine. to any registration requirement within such jurisdiction or country. RAMCIEL Magazine. controls and operates the Site from offices located in the United States and makes no representations or warranties that the information, products or services contained on the Site are appropriate for use or access in other locations. Anyone using or accessing the Site from other locations does so on their own initiative and are responsible for compliance with United States’ and local laws regarding online conduct and acceptable content, if and to the extent such local laws are applicable. We reserve the right to limit the availability of the Site and/or the provision of any content, program, product, service or other feature described or available thereon to any person, geographic area, or jurisdiction, at any time and in our sole discretion, and to limit the quantities of any such content, program, product, service or other feature that we provide. Except with respect to the protection and enforcement of the intellectual property rights of the RAMCIEL Magazine. Parties and their rights to seek and/or obtain injunctive or equitable relief, any claim, cause of action or proceeding arising out of or relating to the Terms or the Site shall be resolved by mandatory, binding arbitration in accordance with the Commercial Arbitration Rules of the American Arbitration Association (“AAA”) as supplemented by AAA’s Supplementary Procedures for Consumer-Related Disputes. Any such claim, cause of action or proceeding shall be arbitrated on an individual basis and without resort to any form of class action. The arbitration shall be conducted in Tempe, Arizona, and the Federal Arbitration Act, and not any state law concerning arbitration, shall apply. Any cause of action or claim you may have with respect to the Site must be commenced within one year after such claim or cause of action arises. The arbitration award shall be final and exclusive, and the prevailing party in the arbitration may file an action in court to confirm and to enforce the arbitration award. Any such action, or any claim, cause of action or proceeding not subject to arbitration as set forth in this section shall be filed and adjudicated in a state or federal court in Maricopa County, Arizona, and all parties agree to submit to the personal jurisdiction of those courts. You irrevocably waive any rights to seek and/or obtain injunctive or other equitable relief and any defense of forum non conveniens. Should either party pursue any other judicial or administrative action with respect to any matter included within the scope of this binding arbitration provision, the responding party will be entitled to recover its costs, expenses and attorneys’ fees incurred as a result of such action. The failure of RAMCIEL Magazine. to act with respect to a breach of these Terms by you or others does not constitute a waiver and will not limit RAMCIEL Magazine.’s rights with respect to such breach or any subsequent breaches. No waiver by RAMCIEL Magazine. of any of these Terms will be of any force or effect unless made in writing and signed by a duly authorized officer of RAMCIEL Magazine.. Neither the course of conduct between the parties nor trade practice will act to modify these Terms. RAMCIEL Magazine. may assign its rights and duties under these Terms to any party at any time without any notice to you. These Terms may not be assigned by you without RAMCIEL Magazine.’s prior written consent. If any provision of these Terms will be unlawful, void, or for any reason unenforceable, then that provision will be deemed severable from these Terms and will not affect the validity and enforceability of any remaining provisions. The Section titles are inserted only as a matter of convenience and have no legal or contractual effect. You agree that these Terms will not be construed against RAMCIEL Magazine. by virtue of having drafted them. RAMCIEL Magazine. reserves the right to modify or add to these Terms at any time without prior notice (“Updated Terms”). You agree that we may notify you of the Updated Terms by posting them on this site so that they are accessible via a link on the home page, and that your use of the Site after we have posted the Updated Terms (or engaging in such other conduct as we may reasonably specify) constitutes your agreement to the Updated Terms. Therefore, you should review these Terms before using the Site. The Updated Terms will be effective as of the time of posting, or such later date as may be specified in the Updated Terms, and will apply to your use of the Site from that point forward.